James Baldwin (1924 – 1987) was an American writer whose essays, poetry and monographs exposed inequalities of American society, in such publications as Go Tell it on the Mountain, Giovanni’s Room and Notes from a Native Son. His material specifically dealt with homosexuality, masculinity and civil rights, and was no doubt informed by his lived experience as a Black homosexual man. This caused some people to be outraged, not only in America but also in New Zealand. 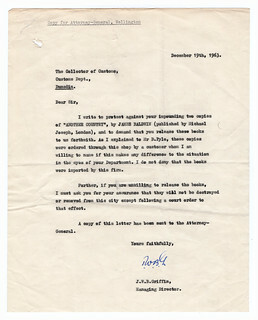 A complaint made to the Justice Department in October 1963 led to one of Baldwin’s books Another Country being referred to the Indecent Publications Tribunal. As a result, the National Library Service were asked to take “appropriate action” (presumably to remove it from circulation) and Customs seized copies as they were entering the country. The Indecent Publications Tribunal later decided against restricting distribution of both the hard and paperback copies. In the letter above J.W.B. Griffin of the University Book Shop in Dunedin protested that copies of Another Country were being impounded by Customs. 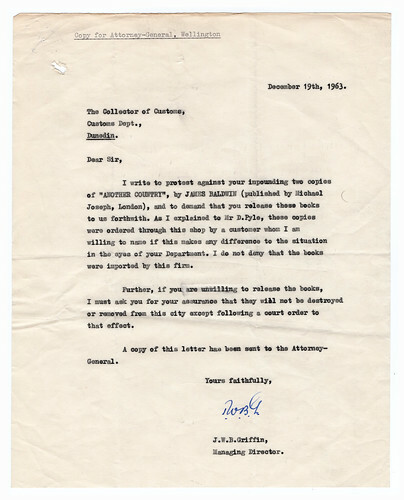 This letter comes from a Department of Justice correspondence file relating to the publication and the Indecent Publications Tribunal.